La Costa real estate specialist, Michael Gaddis, discusses the state of the market in La Costa Greens neighborhood, including La Costa Greens homes for sale, recent sold homes, as well as average cost per square foot of the homes in the area. Whether you’re looking to buy or sell in La Costa Greens, this information can help you plan your real estate strategy. For help or questions about La Costa Greens real estate or other La Costa neighborhoods call 760.487.8266 today to speak with an area specialist. 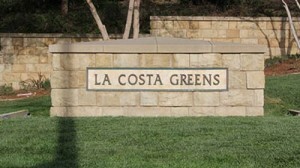 I’m Michael Gaddis, your La Costa Greens real estate expert. Today I’d like to talk to you a little bit about the current state of the real state market in La Costa Greens this is your February 2014 real estate market update all the data in this market update was taken from Sandicor which is the San Diego County Multiple Listing Service the sold at I’ll be referring to occurred between the period January 1st 2014 until February 18 2014 currently in La Costa Greens there are 11 active listings the average I home that is currently active has 4 bedrooms five bass three thousand nine hundred and forty-six square feet and is currently listed for 1.22 million dollars the average list price per square foot is 307 dollars hurt me in the La Costa Greens there is one pending listing pending listing is has five bedrooms five bass 4300 16 square feet and is currently listed for 1.29 nine million dollars which is just a little bit over three hundred dollars a per square foot as far as well as prices cancer there are no contingent La Costa Greens homes on the market right now Contingent listings refer to short sales now some other active listings might be short sales but the data that I call from Sandicor is not necessarily indicate that I but they could be but right now there are no contingent listings so as far as sold listings are concerned there have been two sold listings in the neighborhood since January 1st and I’m referring to the listings are trying to detach talents not attached to a town homes or anything like that I’m just referring strictly detached homes there have been two sold homes these homes average four bedrooms 4 baths 2,791 square feet with an average list price eight hundred and thirty-seven thousand dollars an average list price per square foot 299 dollars square for the average sold price is 840 1,250 with an average sold price per square foot up 301 dollars now that 301 dollars’s works basically current market value a home is 301 dollars per square foot so I sometimes people like to know roughly what the which homes are selling for the highest amount the current active home I at current active listing the home with the highest listing now is and will be here in a second it is I 68-63 tanzanite drive it’s a five-bedroom six path property with four thousand seven hundred and forty five square feet it’s currently listed at one point six ninety five million dollars and has been listed forty seven days now this home just at a price drop so it’s whatever they had it listed or reports now dropped I’m as far as sold listings are concerned the highest sold listing since January 1st was I am 6937 called place I in iOS four bedrooms for bass anna has 2,838 square feet is I had a list prices 829 thousand dollars and Salter 840 two thousand five hundred dollars on January 17 it was on the market for only six days so in fact the other house that sold very close to that and had very a similar numbers it was a four bedroom four bath 2,745 square foot all with a list price is 800 45,000 sold for 840,000 just here and I February 6 so they sold a very very close together I am as far as the price and size up these homes so again my name is Michael Gaddis if you would like to speak to you have any questions for me you can call me al at my office at area code 760 619 5950 760 619 5950 you can visit my website at www.MichaelGaddis.com or you can stop by my office which is located in the towers oppressing branch off Palomar Airport Road which is not too far away from casting earnings so again my name is Michael Gaddis I am A an attorney real estate broker and mortgage broker and as always I give you more but it doesn’t cost you more. This entry was posted in La Costa Greens, La Costa Real Estate, Market Update and tagged la costa greans real estate, La Costa Greens Homes, La Costa Greens Homes for Sale, la costa greens houses, la costa greens houses for sale, La Costa Greens market update, La Costa Greens real estate agent, la costa greens real estate for sale, La Costa Grens homes for sale by admin. Bookmark the permalink.